Rare G. Wiley script "High Nigh"
Rare G. Wiley script "High Nigh" John Owens personal script from the 1970's. John Owens played the part of 'The assistant' in "High Nigh" and this was Johns personal script. 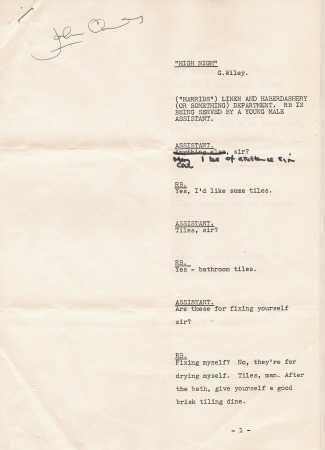 John Owens personal script from the 1970's. John Owens played the part of 'The assistant' in "High Nigh" and this was Johns personal script. John Owens played the part of 'The assistant' in "High Nigh" and this was Johns personal script. John first worked with Ronnie Barker on the Frost Report in 1970 and went on to appear in every series of the Two Ronnies apart from one. Amongst his various roles John was 'The Phantom Raspberry Blower of old London Town' although perhaps most famously he was ' Mr Jones' the other shop assistant in the iconic Fork Handles sketch. Mr Jones appears at the end after Ronnie Corbett stalks off. John has the last line in the sketch and reveals the sign 'Billhooks'. To accompany this sale of a number of scripts John has written a very interesting 2 page letter that talks fondly of his experiences on The Two Ronnies up to 1987. A copy of this letter will be provided with this script. "High Nigh" is one of a small number of scripts that John kept and is a brilliant Gerald Wiley (Ronnie Barker) play on words sketch believed to be from the mid 1970's. This copy of the script has been amended on page 1 as shown in the photograph. This 8 page script has been personally signed by John on the front page and is John's own 'one a kind' personal copy.